Anti-establishment Republicans have tried three times to knock House Speaker Joe Straus, R-San Antonio, out of the top job. Now they're entering an election season nearly five dozen votes short of what they need. 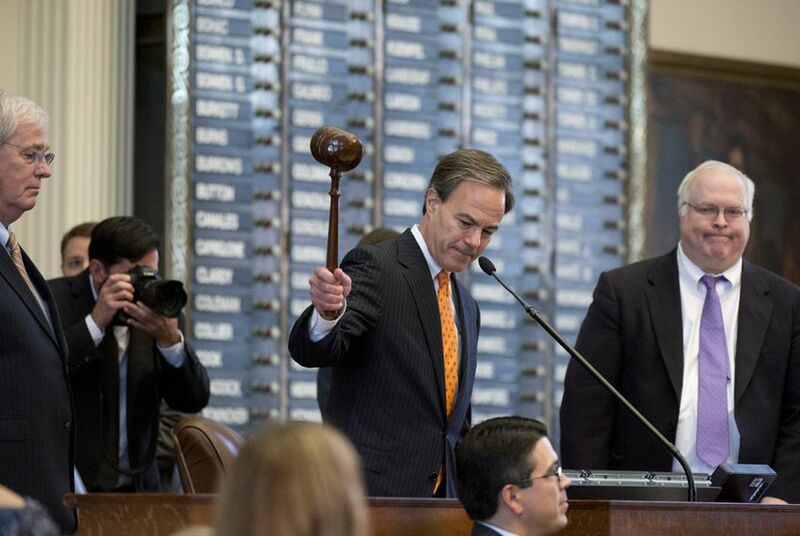 Joe Straus has drawn opposition in each of his three successful re-election bids as Texas House speaker. Nobody has come close. In fact, only one opponent — state Rep. Scott Turner, R-Frisco — asked his fellow House members for a vote. That was last January. Straus got 128 votes. Turner got 19. It was convincing. They couldn’t shut Straus down, and he shut them up. Contrast that with the noise leading up to U.S. House Speaker John Boehner’s announcement last week that he will retire at the end of October. The Republican rabble-rousers in his House made it impossible for him to lead. Boehner couldn’t shut them up, and they shut him down. Numbers don’t always tell you the story. The percentage of Republicans in the Texas House — 68 percent — is higher than the percentage of Republicans in the U.S. House — 57 percent. And the proportion willing to buck the GOP’s own speaker is higher in Texas — about one in five Republicans — than it is in Washington, where it’s about one in six. Statistically speaking, Straus oversees a more Republican body with a bigger anti-establishment group than Boehner does. Unlike Washington, however, the Texas Legislature gives a little power to the minority party. The Republicans have safe majorities in both chambers and yet some of the committees are run by Democrats. Straus and his immediate predecessor, Republican Tom Craddick, were able to replace the Republicans who voted against them with Democrats who would vote for them. As it has turned out for Straus, Republican gains have made it possible for him to win re-election without Democratic help; even if all of the 48 Democrats in the House had joined Turner’s 19 renegade Republicans, Straus would still have won. If they want to win significant legislative influence, the rabble-rousers in the Texas House now have to run a much more difficult obstacle course. Their wing of the party has had real success in Texas Senate elections, making that body a good deal more conservative than it was just a few years ago. And Republican voters replaced Lt. Gov. David Dewhurst with Houston Sen. Dan Patrick, elevating a very conservative lawmaker into management. But the rebels’ attempts to unseat Straus — particularly their most recent foray — have exposed their weaknesses. They’ll need to bring more people to their side — either by knocking off fellow Republicans in primaries or by persuading seemingly content incumbents to ditch their leader and go with someone from the party’s anti-establishment wing. Tales of the long-term weaknesses of Texas Democrats are commonplace. The party that long dominated state politics is a memory. No Democrat has won a statewide election since 1994. Their numbers in the Legislature took a serious nosedive after Republicans there gained control of redistricting and drew maps that have prevented the Democrats’ resurrection. But for all that, they outnumber the anti-Straus Republicans in the House by more than two-to-one. The really competitive elections are in the primaries, where each party replaces its own retirees and renegades with new faces. That’s where the Republican insurgents hope to make their gains in the House. They did it in the Senate, helped by a combination of spirited upsets and more peaceful successions. The House is a bigger challenge, though. Voters don’t elect the top dog — the members do. And the raucous caucus — the anti-establishment conservatives who pillory the current speaker as insufficiently conservative — don’t have the numbers right now to take over. At last check, they were about 57 votes short.